My husband microwaved raw broccoli in water the other day to serve beside some fish he was making, and I realized not everyone knows how easy it is to steam. And it is So Much Better. I grew up with broccoli as an elaborate boiled side dish with ethnic flavorings, lots of lemon and garlic and olive oil! I always thought the lemon in that dish demanded the broccoli surrender it’s flavor. Asking only it’s shape. I like the taste of broccoli itself, framed by more delicate pairings. And I like it steamed better – its firmer. So, I put together this quick herb, onion and garlic recipe. Place two cups of water in your 2 quart sauce pan with lid on high heat. 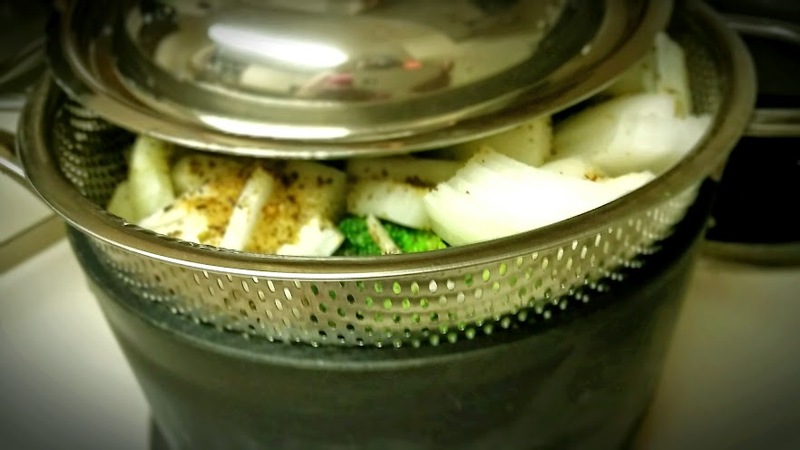 In a small metal colander with handles, add your florets, onion, garlic, and seasonings over top. When the water’s boiling, add the colander, and place the lid over the colander. The veggies will steam and the flavors will infuse the broccoli. Remove from heat at about ten minutes, broccoli should have softened. Serve immediately.